Our Mexican QSR franchise is fast, cravable and growing swiftly across the U.S.
Once you try it, you get it. You get why Taco John’s is one of the largest Mexican quick-service restaurant brands in the U.S. and why our bold, original menu has developed a devoted fan following since we first opened in Cheyenne, WY, in 1969. 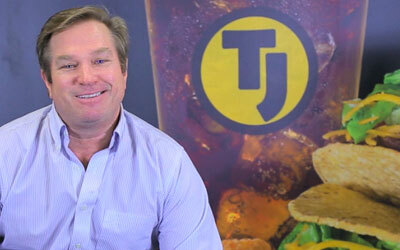 And when you take a deeper look into our operations, our franchise support systems and our dedicated, experienced leadership, you get why we’re one of the fastest-growing Mexican QSR franchise brands in the U.S.
Taco John’s had a record-setting year for new commitments in 2017, including the biggest deal in our company’s history: a 100-unit franchise agreement to introduce our brand into new territories in the South. With almost 400 stores open and commitments for over 150 new units in the coming years, Taco John’s is poised for dramatic growth. We are taking Taco John’s to new heights. We’ve got prime territory, superior franchise support systems and a unique twist on Mexican food that guests crave. 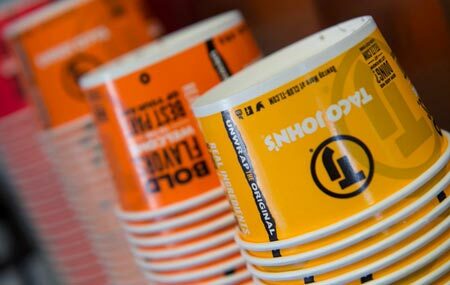 With nearly 50 years of success in what is now the fastest-growing segment in QSR, Taco John’s offers a number of advantages to potential franchisees. Simply put, Americans love Mexican food. Mexican restaurants represent 9% of the restaurant industry, according to foodservice analyst CHD Expert – edging out pizza places and coming in second only behind burger joints. Within that segment, there’s only one QSR Mexican franchise brand competing with us on a nationwide scale. They are virtually sold out while we have prime territory available to take advantage of the market potential. Taco John’s has been in business for a half-century and has only one national competitor in the Mexican fast-food franchise space, making our franchise ideal for the savvy investor. Our hundreds of locations are especially concentrated in the Midwest, but we still have a lot of prime territory available. Over the next 5-10 years, we are committed to bringing the Taco John’s brand to areas that have never before experienced convenience and value-driven food that tastes like the quality you would expect from a fast-casual concept. As we continue to expand strategically, we’re seeking experienced foodservice and retail brand operators. The ideal candidate is willing to be trained on how to consistently execute our operational systems. Taco John’s provides extensive development support, training and operations support, and ongoing support. Plus, you will have access to our experienced leadership team as well as fellow franchise owners. To learn more about our business model, operations and earnings potential, please click the button below.